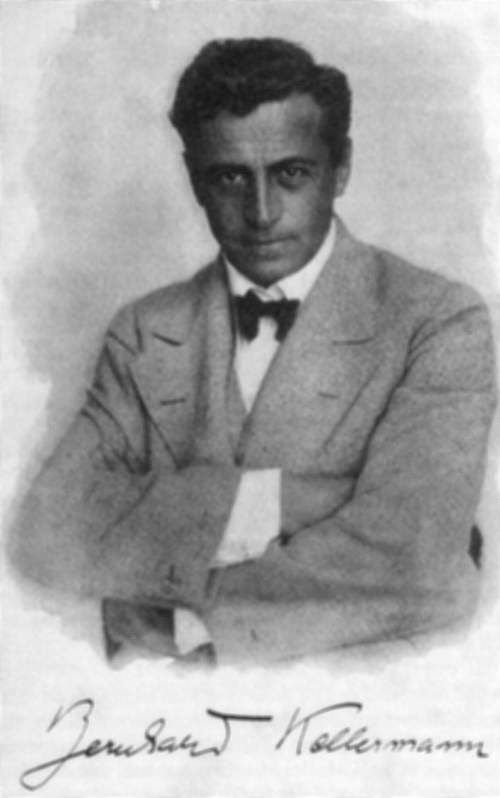 During the Great War, Kellermann worked as a correspondent for the Berliner Tageblatt, one of Germay’s leading newspapers. He wrote lively reports of the war, some of which were collected in a book: Der Krieg im Westen: Kriegsberichte (Berlin: Fischer, 1915) (The War in the West: War Reports). This contained twenty-nine short essays (218 pages in all), covering such topics as “The Fire of Ypres”, “The Battle Fields of Flanders”, “A Flyer over Bruges”, “Night Battles at Arras”, “The Imprisoned Socialist”, “The Battle under the Ground”, ending with “The Victorious Attack on the Argonne on 8 September”. The reports are all dated between May and September 1915. His novel The Ninth of November, written immediately after the war and focussing on the political revolution triggered by Germany’s defeat, contains implicit criticism of the conduct of the war and specifically of the dominance of the military in German society.